For the last forty years, Mary Lou Kilian has worked diligently to strengthen the faith knowledge of the people of the North Country and to tell the faith stories of our sisters and brothers. In 1984, she became the first lay editor of the North Country Catholic. WOW—1984 when Phil Collins, Kenny Rogers and Billy Joel were household names and when gas was $1.21 a gallon, a 1st class stamp cost $.20, and a new Dodge Ram truck went for $8,995. Boy, haven’t times changed! As I was reflecting on certain other popular items of 1984, I remembered the popular TV show, Dynasty, which so many were watching while Mary Lou was beginning her own 34-year Dynasty as editor of our diocesan newspaper. These years have seen Mary Lou become a premier journalist, winning awards by the Catholic Press Association. In 1996, she received the Archbishop Edward T. O’Meara Award for World Mission News coverage and, in 1998, Bishop Loverde awarded her the Bishop Edgar P. Wadhams Award for Distinguished Service to the Diocese of Ogdensburg. These well-earned citations rightly acknowledge and honor a gifted writer whose vocation has been steeped in self-less service to the Church. Her inspiring editorials always made insightful links between what’s happening in our families, our diocesan family, the Church universal and the world. A popular 1984 movie that continues to attract millions today is Star Trek: The Search for Spock. I’m not sure if Mary Lou is a trekkie, but she has challenged us, given the current trend away from the traditional print media, to join others in the trek to go where no person has gone before: cyberspace, Facebook, and beyond. She has also coordinated pilgrimages to holy sites in Italy and Ireland, not searching for Spock, but seeking opportunities for pilgrims to touch base with their spiritual/cultural roots. The bishop’s words seventy-two years ago, ring so true today. There remains a crisis of faith and every one of us has a responsibility to be informed messengers of hope. Certainly, for the last thirty-four years, Mary Lou Kilian has, as editor of our diocesan newspaper, worked hard to enable our Catholic homes to be strengthened in their faith as we face the many challenges in today’s culture. On its tenth space shuttle mission, back in 1984, the astronauts aboard the Space Shuttle Challenger led the first mission where the astronauts attempted an un-tethered spacewalk using propulsive backpacks. Well, Mary Lou, thirty-four years later, has become untethered from working on weekends and freed from all those commitments and sacrifices that she, Deacon Tom and her family have made so that people from across our diocese and beyond could learn more about what has been happening in our Church. 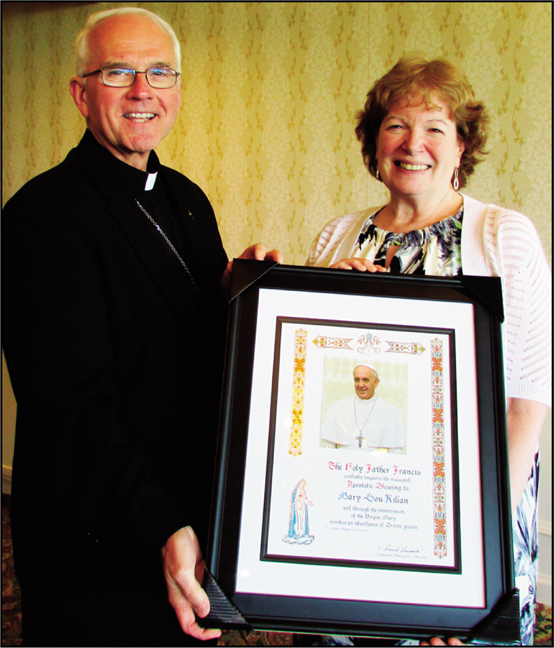 Saying “Thank you” cannot capture the breadth and the depth of gratitude that this bishop, this local Church wants to express to Mary Lou, as her inspiring leadership in our communications efforts comes to a close. We thank her for making such a positive impact for so many through the years. God keep her healthy and happy as she begins this new phase of her life. God Bless her and her loved ones!